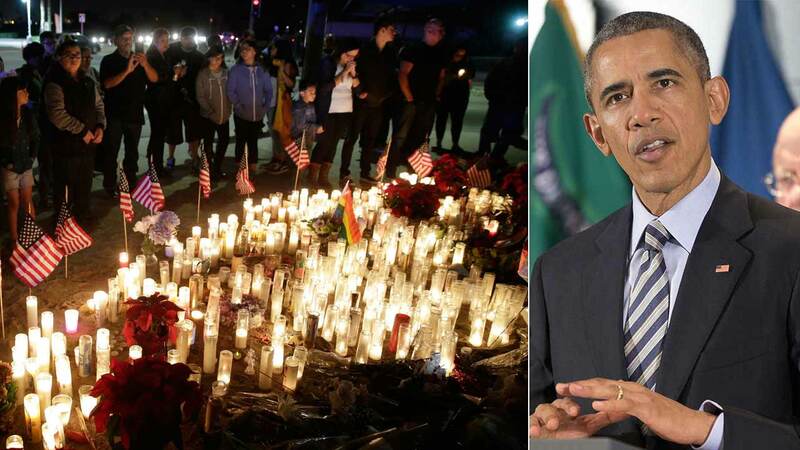 SAN BERNARDINO, Calif. -- President Barack Obama's plan to meet privately with families of the victims of the San Bernardino terror attack Friday night will provide comfort for some, but others say his visit comes too little, too late. Mr. Obama and first lady Michelle Obama will land in Southern California at about 7:40 p.m. PT before heading to Hawaii for their annual Christmas vacation at about 9:35 p.m. PT. "Obviously, those families are going through a difficult time, not just because they've lost loved ones, but obviously at the holiday season I think that loss is even more acute," said White House press secretary Josh Earnest. "The president felt before he could begin his holiday that it was important for him to spend some time with these Americans who are mourning." Fourteen people were killed and 22 others were injured when Syed Farook, 28, and Tashfeen Malik, 29, opened fire on his colleagues at a holiday luncheon at the Inland Regional Center on Dec. 2. Both were killed in a shootout with police. The couple pledged allegiance to a leader of the Islamic State group on Facebook, moments before the shooting, authorities said. But they have found no evidence that the Farook and Malik were carrying out instructions from an overseas terrorist group or that they were part of a U.S.-based conspiracy. "When terrorists pull off a despicable act like what happened in San Bernardino, it tears at our hearts, but it also stiffens our resolve to learn whatever lessons we can and to make any improvements that are needed," Mr. Obama said during a news conference at the National Counterterrorism Center Thursday. In the aftermath of the massacre, two victim relatives described conflicting emotions: One hopeful, the other with doubt. "It doesn't bring her back," said Evelyn Godoy, whose sister-in-law, Aurora Godoy, was killed in the attack. She said she couldn't help but feel "like we were a throw in" after reading that the president was stopping in San Bernardino while en route to Hawaii for his annual holiday getaway. Robel Tekleab, whose brother-in-law, Isaac Amanios, was killed, said he greatly admires Mr. Obama and wants him to know who Amanios was. "His presence itself is comforting," he said. Meanwhile, San Bernardino County Supervisor Curt Hagman is criticizing the president's limited list of meetings. "Barack Obama should meet with families of wounded and first responders, too," Hagman tweeted. Click here for more information on the San Bernardino shooting.